No one directly quoted one of Tom Petty’s enduring hits during Wednesday night’s spirited and packed “Cowboys Kickoff” event. “Into the Great Wide Open” pretty much says it all, though, about the team’s 2016 prospects. Absent the injured Tony Romo, heavily dependent on two rookie offensive starters and saddled with a highly maligned defense, the Dallas Cowboys begin their regular season Sunday against the New York Giants as a blank slate of best and worse case scenarios. Sham, the Cowboys’ signature radio play-by-play voice since 1984, was joined by the two other members of a team that’s been together since 1998 (when Sham returned after three seasons with the Texas Rangers). 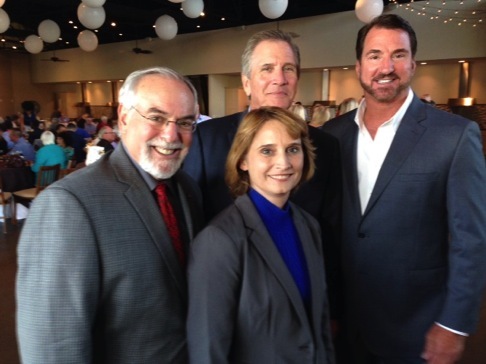 Former CBS11 sports anchor and ex-Cowboys quarterback Babe Laufenberg is the analyst and Kristi Scales has spent a quarter century as the go-to sideline reporter. Panel moderator Mike Doocy, Fox4’s lead sports anchor since 1993, joined the radio team for one season (in 1997) as co-analyst with Laufenberg. The official Cowboys radio network reaches every Texas market and four adjoining states, with Dallas-based KRLD-FM (105.3 “The Fan”) the flagship station since 2009. 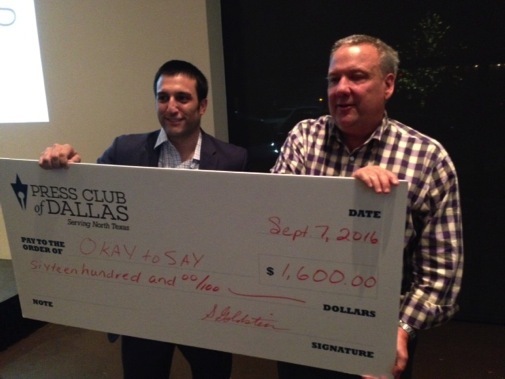 Held at the 3015 at Trinity Groves event center and sponsored by the Press Club of Dallas, “Cowboys Kickoff” drew a crowd of about 175 and featured a companion charity raffle that ended up netting okaytosay.org a $1,600 check at the end of the evening. Some of the more coveted donated items were a signed Dirk Nowitzki jersey; an autographed Ezekiel Elliott football; not one but two footballs signed by Roger Staubach; baseballs autographed by Pudge Rodriguez and Cole Hamels; a Dallas Stars cap signed by Jamie Benn; and two tickets (plus a parking pass and field passes to watch team warmups) before the Cowboys’ Dec. 18th home game against the Tampa Bay Buccaneers. We now return you to the injury-pocked Cowboys, with Sham, Laufenberg and Scales all singing the praises of QB Dak Prescott as a mature-beyond-his-years rookie who just may be able to step in and immediately excel while Romo’s broken back heals for however long it takes. “He is full of the experience. But he’s not in any way full of himself,” Sham said. Scales likewise praised Prescott’s maturity -- “He doesn’t act like a rookie” -- before Laufenberg later doubled down. “The greatest hope,” he said, “is that Tony Romo never plays another down for the Dallas Cowboys ever.” By that he meant that if Prescott somehow goes unbeaten (or close to it) during Romo’s absence, then the Cowboys may decide to keep the rookie in the starter’s role. Not that many think this will happen. Romo’s stunning injury, early in the third pre-season game against the Seattle Seahawks, sent Scales into full red alert. “It was like crushing a soda can,” she said of Romo’s awkward position when he was hit from behind and immediately grasped his lower back. Sham as usual was doing the radio broadcast of the game while Laufenberg moonlighted with a TV team. Suddenly, “the only thing we care about is what Kristi tells us about Romo,” he said, terming her “absolutely the best sideline reporter in any sport on radio or television.” That assessment drew sustained applause. 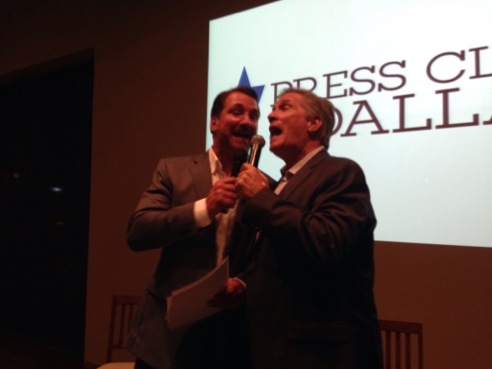 Music to their ears: The climactic, show-stopping Babe/Doocy duet. Unlike Prescott, fellow rookie Ezekiel Elliott was fully expected to immediately step in and play a major role in the Cowboys’ offense. But his visit to a legal marijuana shop while in Seattle put him in the crosshairs of a TMZ-fed “social media” frenzy. Elliott subsequently apologized for bad judgment. “He’s a young kid with an incredible amount of God-given ability . . . And he’s going to have to grow into all of that,” Sham said. He also challenged attendees to recall the “goofiest thing you ever did as a kid” in pre-cell phone, Twitter, Facebook times. Would anyone want that living forevermore on the Internet? Less time was spent talking about the Cowboys’ drug suspension-wracked defense, of which next to nothing is expected going into the new season. But Sham noted that this has been the case before, as recently as the 2014 season, when Dallas went 12-4 while keeping the defense off the field as much as possible. Even so, Sham is a realist. “I believe it can be average,” he said of the Cowboys’ D. That deadpan assessment got more than a few laughs. During the Q & A portion, panelists were asked to elaborate on moments with the Cowboys that have left lasting impressions. Scales remembered Romo sobbing in the Cowboys’ locker room after his fumble of a field goal snap took the team from a possible victory to a gut-grinding 2007 post-season loss at Seattle. Laufenberg recalled trying to boost receiver Dez Bryant’s spirits after the team’s last-minute, Jan. 2015 post-season loss at Green Bay. The key call in the game was a Bryant catch of a long Romo pass that was ruled a non-catch upon further review. But the wistful Robert Frost poetic award went to Sham, who remembered the 3-13 1988 Cowboys team as by far the worst he’d ever seen -- even surpassing the subsequent season’s 1-15 team in Jimmy Johnson’s first year as head coach. Many of those same players were a part of the “rising from the ashes” team that won the 1993 Super Bowl in the Rose Bowl. Sham said he’d never been to the Rose Bowl before, and reveled in the dew still on the grass for an afternoon game while mountains towered in the distance. It tempered all the “heartbreak” of previous seasons, he said, with a young team growing together and at last triumphing under Johnson. Then there’s Skip Bayless, the former Dallas newspaper columnist (for both the Morning News and Times-Herald) whose book, Hell-Bent, speculated on whether Cowboys quarterback Troy Aikman might be gay. Aikman has never forgotten -- or forgiven. As Fox’s lead NFL analyst since 2002, he’s not at all happy with his network’s recent luring of Bayless from ESPN. Sham said it goes against his faith to disparage individuals. But in the Bayless situation, he’s clearly on Team Aikman. During his time in Dallas, Bayless “demonstrated that he was more interested in writing something that would gather a reaction than writing something that was true,” Sham told a questioner from the audience. Or to put it more succinctly, Bayless was trolling for “click bait” before the term was invented. The panel ended with the quartet being asked to make one Hall of Fame choice among Drew Pearson, Jimmy Johnson and Jerry Jones. If they had only a single vote, who would be inducted first from that trio? Sham and Scales went with Pearson while Laufenberg and Doocy chose Jones. Your friendly content provider, who as a Press Club board member served as the Cowboys Kickoff event’s principal organizer and emcee, broke the tie by going with -- Pearson. And that’s it, save for the picture below of Press Club president Scott Goldstein (left) presenting a $1,600 check to okaytosay.org representative Ken Luce. Many thanks to all who attended, with gold stars for those who also took their chances with raffle tickets. Cowboys Kickoff ended up being Press Club’s best-attended of three events held so far at Trinity Groves, whose staff (headed by Heather Pickett) also should take a bow for their continued excellent food and service.